I’ve mentioned that I love Mexican food, right? I had some tortillas and Greek yogurt that needed to be used up and the tomatoes were ripening too quickly, so those guys needed to be eaten too. This quick dinner was just what we needed to fill us up and there were even leftovers for lunch the next day! Place the tortillas on a plate, cover with damp paper towel, microwave for 1 minute. Spread 2tbsp of enchilada sauce over the tortilla. 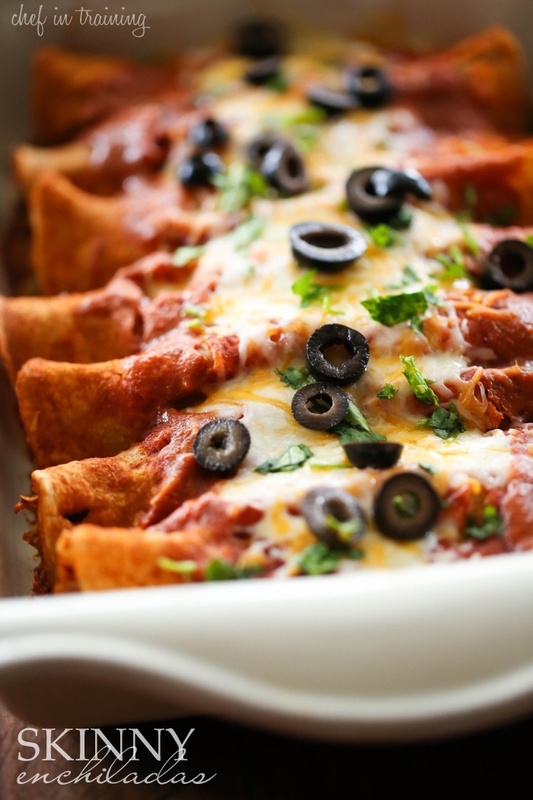 Place shredded chicken along one edge of the tortilla and roll up to form enchilada. Place in a greased 9×13. Repeat for remaining tortillas. Pour remaining sauce over the top of enchiladas. Sprinkle ½ cup shredded cheese over the top. Bake at 375 degrees F for 20-30 minutes until heated through and cheese is melted. Garnish with cilantro, olives and tomatoes. Serve with salsa, sour cream and guacamole.